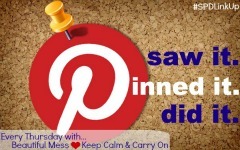 Today I'm linking up with Katie and Steph for their Saw it, Pinned it, Did it link up! I love this link up because it gives me an excuse to do all of the holiday crafts I pinned and would otherwise probably never get around to doing. It also just so happens that today is not only this fabulous link-up, but the day Bennett is arriving (my worries in this post came true, and she was delayed a few days), AND her 24th birthday! So I knew her present/welcome basket had to be extra special. Since this is the first time I am seeing her in exactly a year and a half (to the day) I figured a basket with throw backs to our college sorority days was in order. Cheap wine and glitter. And lots of it. So, when I saw this on Pinterest I knew it had to be part of her basket. It was inexpensive, fun, and so easy (which is a must for me)! 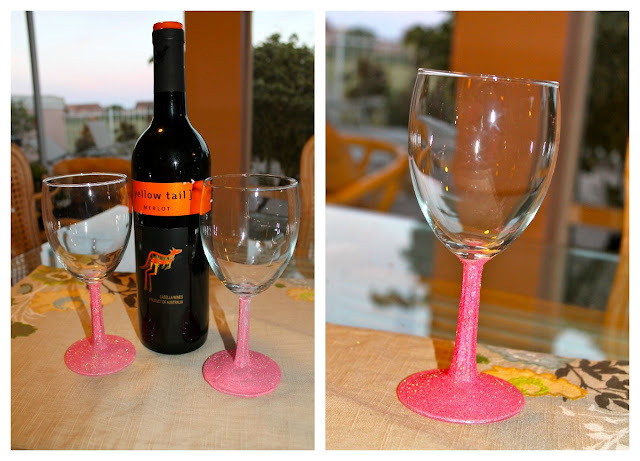 All you need are wine glasses, modge podge, a brush, and the glitter of your choice! You can also seal it with a layer or two of lacquer to make them hand washable. First, paint the portion of the glass you want to glitterify with modge podge. Leave to dry over night and you're done. The next morning, spray with lacquer to seal it all up. Just add wine, and you're really good to go! Love the glitter! Glitter + Pink = can't go wrong! Glitter with reckless abandon..you're a girl after my own heart. LOVE THAT!...and anything that sparkles. These are so cute!! And how easy is this DIY - love it! So cute!! Love how the glitter matched your shirt too, ha! Glitter and wine--sounds like you girls would have fit in very well at the Beta Tau house! This is so awesome! I wish I got the craft gene that my brother got. I see so much on Pinterest that never turns out quite how I'd like it to! Love the pink! So cute and look so easy! Perfect thing to add to a gift basket! I've been wanting to do this for awhile now! Yours looks great! I am meeting you through the Facebook | Twitter Blog Hop! This would be such a great Xmas gift for my sister in law! These are so cute! I actually have a little something similar up my sleeve to work on tonight or tomorrow! SO doing this! How perfect are these for bachelorette parties??! And so easy!! Oh this is too cute!!! I am going to have to try this out! These are fab! What a fun idea! Pinning it. I've been wanting to try that!